The pressure on the footy was really impressive by Collingwood in a real arm wrestle to begin. Collingwood had a bit more of the ball and used it quickly inside their forward half of the ground, but were not able to find their forward targets. Julia Crockett-Grills placed a red-hot tackle in the middle for Geelong. The opening goal of the season was scored of Collingwood’s Sophie Alexander’s boot. Collingwood were on top early but did not take their opportunities in front of goal, as they continued to blaze away at 50 and allowed Geelong defenders to intercept mark the ball easily. Nina Morrison and Madeline Keryk were the main prime movers in the first quarter for Geelong. Geelong placed a lot of great tackles but they were yet to get the ball into their forward half of the ground. Geelong tried to get the ball forward but Collingwood had the answers in the quarter. Sharni Layton gave away a 50m penalty for running through protected area and gifted Madeline Boyd with her first ever goal in AFLW. 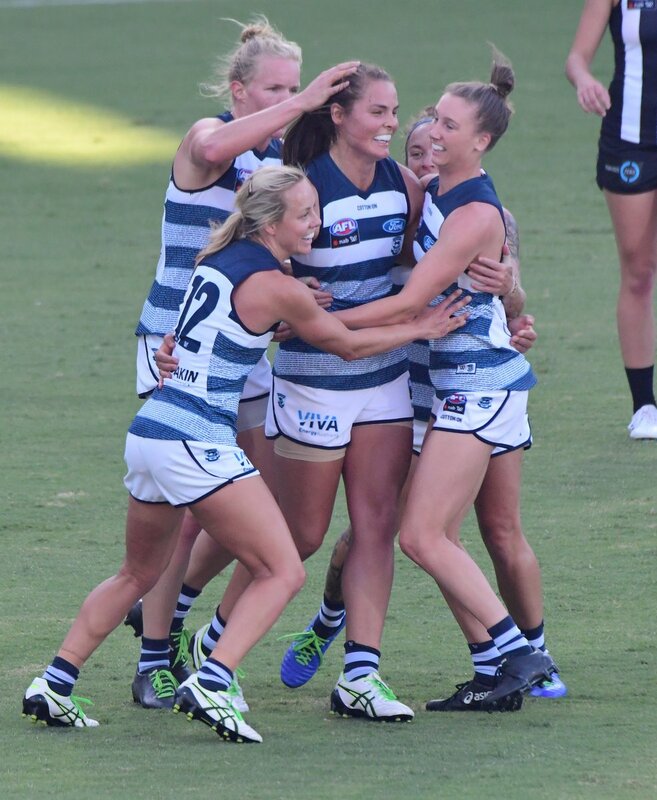 This marked a historic moment for Geelong with their first goal in AFLW. Geelong wrestled back momentum towards the end of the opening term. At quarter time Collingwood were on top by a point over Geelong. Geelong continued their strong momentum and gained back the ascendency over Collingwood with more ball composure in the second term. It paid off, as Mia-Rae Clifford snapped accurately for Geelong’s second goal. Geelong’s pressure around the ground lifted and forced mistakes from Collingwood’s players. A free kick was awarded to Geelong deep in their forward 50 to Geelong local Madeleine Boyd who slotted through her second goal from directly in front. Geelong was able to get deeper forward entries and this placed significant pressure on Collingwood’s defenders. Madeleine Boyd has had a superb first half of football. At the main break Geelong was up by 11 points over Collingwood who were kept scoreless. Sharni Layton with a bit of friendly fire, as she went back with the flight of the ball and bumped into Collingwood’s lone goal scorer Sophie Alexander. Alexander went off the ground with concussion early on. Sarah D’Arcy reduced the margin to five points for Collingwood with the opening goal of the term. The impressive difference for Geelong was there short kicks to their teammates compared to Collingwood. Collingwood wrestled back some momentum in the quarter. Great run down tackle from Collingwood’s Allen who stopped Geelong’s run towards goal. Collingwood right back in the match, owned the third quarter as they lifted their intensity. D’Arcy passed the ball to Jaimee Lambert who slotted through an amazing goal. A great battle between the two teams as the match went up another gear. Ash Brazill played well in defense for Collingwood. Meg McDonald solid down back all match for Geelong. Collingwood had a slight advantage of a point over Geelong at three quarter time. Final stanza was high pressured and tight in and around the contest. Both teams gave it their all in a tough final quarter. The number one draft Morrison had a huge influence in the match and was awarded a free kick as she was tackled without the ball deep inside 50 late in the last quarter. Unfortunate for her it was through for a minor score but it was the handy point Geelong won by at the end of the match. A historic night was made even sweeter for the Geelong Football Club down at their home who pulled off the gritty win. Collingwood debutant and Mayo ladies footballer Sarah Rowe finished the night with 6 kicks, 6 disposals, 2 marks and 1 tackle.